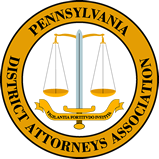 The Pennsylvania District Attorneys Association congratulates the Pennsylvania House of Representatives for overwhelmingly passing legislation that will disarm domestic abusers. In a bipartisan vote today, the House approved legislation by Representative Marguerite Quinn (R-143) H.B. 2060, which will require the surrender of firearms belonging to those whom final protection from abuse orders have been ordered. The bill will also limit the numbers of third parties that can store the firearms belonging to such abusers. According to the Pennsylvania Coalition Against Domestic Violence, in 2017 of the more than 100 women, men and children who lost their lives to domestic violence in Pennsylvania, two-thirds were fatally shot. According to the National Law Enforcement Officers Memorial Fund, domestic disputes are the number one circumstance for firearms-related officer deaths. The bill will now move to the Senate, which has already passed similar legislation sponsored by Senator Tom Killion (R-9).